Rabbi Chaim Richman, director of the Temple Institute, on Wednesday condemned the police decision to ban Rabbi Yehuda Kroizer, the Chief Rabbi of Mitzpe Yericho and the dean of Hara'ayon Hayehudi Yeshiva in Jerusalem, from visiting the Temple Mount. Speaking to Arutz Sheva on late Tuesday, Rabbi Kroizer explained that last Wednesday when he tried to ascend the Mount - the holiest site in Judaism - he was blocked, because he wrote a booklet on the Jewish legal facets of the Temple offerings ten years ago. 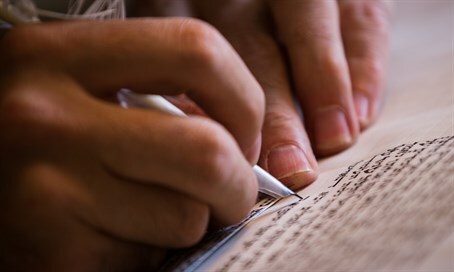 "It is inconceivable that a renowned and venerable Torah scholar should be punitively punished for doing what Torah scholars should do...publish works that elucidate and clarify Jewish law," warned Rabbi Richman. He noted that the rabbi's ban "for the ‘crime’ of authoring a book on Torah law, is tantamount to the criminalization of Torah itself. Nothing can be more anti-Semitic than the outlawing of a rabbi for being occupied with words of Torah. This horrendous and unthinkable act conjures up the worst periods of Jewish history, and is reminiscent of the most infamous and repressive regimes under which Jews suffered for the crime of being Jews, throughout the years of their exile." In making the discriminatory ban, the police claimed they were doing so out of concerns that someone would read Rabbi Kroizer's ten-year-old booklet and try to sacrifice a Passover offering at the Temple Mount. Taking issue with the claim, Rabbi Richman said, "it is the Torah itself that commands all of Israel to slaughter the Passover lamb, and the G-d of Israel declares it to be ‘an eternal ordinance.’ Is the Torah itself next in line to be silenced? Is the G-d of Israel to be banned in the State of Israel?" "This year, once again, the Temple Institute, together with other Temple organizations, will be holding a practice Passover offering drill, so that all of Israel becomes familiar with its laws and requirements…paving the way for our people to fulfill its national destiny by bringing the Passover offering to the Temple Mount – may it be this year."